You may not have heard of speech level singing before, but it is a technique used by many singing stars, including Jennifer Lopez and Michael Jackson, among others. The idea of speech level singing is to produce tones easily, as if you were speaking, without the discomfort or voice strain that is usually associated with singing exercises. Seth Riggs (American vocal coach) is the creator and founder of this unique singing technique. So What Do Speech Level Singing Exercises Really Entail? How Do Speech Level Singing Exercises Related to Your Singing Voice? Speech Level Singing or Vocal Breathing Exercises? Singing Success’s Speech Level Singing? It’s known to be a kind of approach in singing that enable you to sing easily just like when you’re speaking. You can create a powerful, unique and passionate kind of voice through this technique by simply neutralizing your larynx, and relieving tension completely. This method is focused mainly on connecting of your vocal cords, and neutralizing your larynx. The moment that your vocal cords are already connected and your larynx is neutral, you can be sure that your vocal range will become seamless from top to bottom. You see, between your chest voice and your head voice is something that is commonly referred to, in speech level singing, as your mixed voice. When the resonance begins to go behind your soft palate, the split leaves some of it in your head and some in your mouth. The mixture of both head and chest voices is called a mixed voice. Your larynx, also known as a voice box, has two very different sets of muscles that you should be concerned about, inner and outer. Many singers try to use their outer larynx muscles to control their voice, but that will just cause your vocal chords to tense up. Therefore, it can create discomfort and it certainly won’t help you improve your singing voice. 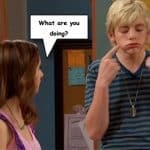 If you try singing a high note and your Adams Apple moves, you are singing with too much tension. That sort of thing can cause you to have bad sore throats. The tension involved is going to make you sing worse, too! On the other hand, will be much more effective and without causing so much discomfort! Speech level singing accomplishes that goal by helping you to train your inner larynx muscles, not your outer larynx muscles. Your inner larynx muscles are much better at controlling your vocal chords properly. So, your larynx can stay in one position, just as it does when you are talking. Even as your larynx adjusts your vocal chords, you can sing comfortably, without straining your voice, as a result. One interesting side-effect of training your inner larynx muscles to stay still is that it will also have the added benefit of helping you to regulate your resonance and breathing automatically. Many singing coaches recommend vocal breathing exercises to do just that, but they often have poor results, since they utilize the outer larynx muscles, not the inner larynx muscles. So, if you want to sing better, you really should consider exercising your inner larynx muscles, rather than your outer larynx muscles. That way, you can improve your breathing and your resonance, as well as being more comfortable as you are singing. As a result, your vocal range, tone and vocal power are all bound to improve. All it takes is a lot of time, a lot of patience and a lot of practice. When you consider all of those benefits, why not give speech level singing exercises a try? 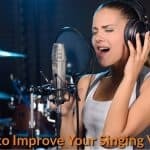 When you learn to know the different techniques that can help you learn singing effectively, then these exercises is among the best singing techniques we have currently discovered. Actually, the various lessons we embarked on for the past couple of years were mainly based on the technique mentioned above and almost everything we are going to discuss on this website will be determined by this technique. One of the most common concerns of singers is that their larynx is rising too high the moment they ascend in pitch, which prevents their voice from releasing. Another issue is that they tend to lose their vocal compression when they rise in pitch that causes them to pull up their chest voice and shout, or suddenly shift to falsetto. 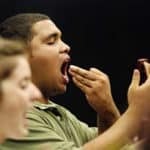 In speech level singing techniques, you’ll learn how to fix these issues through constant diagnostic training and exercise. The most wonderful aspect of these techniques is that they don’t aim to overwhelm your voice with musical jargon. Of course understanding this musical jargon is something important while you progress in your career in singing. On the other hand, an ordinary singer usually does not aim to understand this type of jargon. In general, an average singer simply wants to learn singing in public without all those complications. Speech level singing techniques teach you the proper ways on how to sing like a professional singer. In actual sense, the speech level singing method requires maintaining the larynx or a voice box within a very stable and comfortable pose all through the entire vocal range. A simple example maybe when you gently put your fingers onto the outer area of the Adam’s apple and observe yourself in the mirror, you may realize that the fingers will remain quite stable as you continue to speak with your normal voice. However, if you either swallow or yawn, it will definitely decrease or increase accordingly. Speech level singing techniques are the methods usually used by several celebrity singers. Some of the big names include Jennifer Lopez, Michael Jackson and many others. It helps in making your tones to sound like speech level for instance a soft speaking tone. If you sing and yet you have never acquired any proper technique, the larynx is likely to rise (for instance when swallowing) which causes outer larynx muscles to constrain your vocal cord movements. Eventually, this might lead to straining, a poor sound, and maybe failure to hit specific notes. Therefore, they are very helpful in eliminating the “movement” larynx problem, and the exercises teach different natural breathing techniques appropriate when you are singing, and most importantly they produce good results (definitely with regular practice) such as a strain-free and flexible voice. Several exercises are very helpful and powerful when you use the speech level technique. One of these exercises enabled me to perform a complete octave rise in my vocal range simply after the first session routine! In addition, there are other exercises which can teach you ways to develop a very graceful vibrato, sing with a lovely tone all through the entire range and so on. You need to know that this particular course is still an “unofficial” version of speech level singing exercises. From my understanding, once a specialized speech-level singing tutor, the inventor of the course has since followed a different path. After you take speech level singing exercises, then you will posses skills which you have never exposed yourself to hit higher notes easily. You can explore possibilities in your voice which you were not sure existed. It is irresistibly exciting! Well, I guess you will investigate all the vocal resources which I have enjoyed sharing with you within this article. Hence, They are very effective techniques you will have to use in order to develop a fantastic singing voice and with regular practice, you will enjoy noticing that all your vocal constrains have somehow disappeared. In the process of singing, it is the muscles responsible in coordinating the vocal cords that are considered the most important muscles. However, you may be amazed to know that, they are also regarded as the most underdeveloped muscles that a lot of singers have. These singers rely mostly on their swallowing muscles and squeezing the vocal cords. This practice is not recommended for singers because it causes strain. This way, you can avoid having sore throat every time you sing using this kind of improper technique. 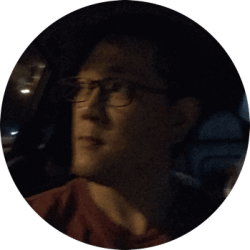 But even if you’ve been used to it for a long time, you can still do something to correct it by following the guidelines given in this article. Here, you’ll learn the proper way of releasing your voice coming from these muscles. You’ll also learn how to change it with a kind of voice that could be of great help in singing correctly. Did you ever wonder just how important vocal breathing exercises really are? Have singing coaches ever told you “Sing from your diaphragm!”? I bet they have! Many vocal instructors say that vocal breathing exercises are definitely the way to go. However, I disagree. After years of practicing “diaphragmatic breathing”, with little success, I decided to explore other options. I soon discovered that learning how to practice speech level exercises was much more effective than doing traditional vocal breathing exercises. I am not alone in these thoughts. Such stars as Whoopi Goldberg, Michael Jackson, Keith Urban and Stevie Wonder also use speech level singing techniques, rather than traditional vocal breathing exercises. Why is all of this the case? Well, one reason is that it takes very little air to sing, actually. Also, when you sing higher notes, your vocal chords will close off a bit. That means that you actually require less air to sing higher, not more. Although many vocal breathing exercises teachers tell you to give your voice more support, meaning send more air to your vocal chords, sending more pressure to your chords when they are already requiring less air will not be useful at all. In fact, it may even be painful to you. That is one of the primary reasons why I feel that focusing on speech level singing is much more important than practicing vocal breathing exercises. These exercises allow you to practice without putting unnecessary strain on your voice. Its include targeting and strengthening the specific muscles you need to use, in order to sing better. That means that your vocal chords will work better and you will be able to easily hit any note that is within your range. You will no longer have to strain to reach certain notes. It also means that your voice will have a consistent sound. There are a couple of interesting, positive bonuses to using that technique, rather than vocal breathing exercises. One is that, as your vocal chords begin to “zip up” when you practice speech level singing, you will find that you will be able to hit notes that you didn’t even realize were in the realm of possibility before. That’s how much your comfort and range will increase. The other is that, as you do speech level exercises, your air pressure will balance out naturally. That means that you’ll have mastered ‘diaphragmatic breathing” anyway, while improving your voice in many other ways. So, don’t waste time doing vocal breathing exercises that are getting you nowhere. In no time at all, you’ll be singing with the same ease as some of your favorite superstars. 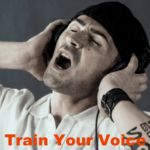 You don’t need vocal breathing exercises to improve your voice! The next important thing that you should render is the vocal training which may have a great impact on your singing career. This is a type of training program that involves values and exercises on speech level singing. They are important to you as a singer, and in fact, they could even do something to bring you to the next level in singing. You’ll find that some of these exercises are really powerful. With it, you can experience to have an increase in your octave of vocal range in just your first session of performing it. In these exercises, you’ll also be introduced on lessons that touch on singing with good melody in your full range, the right procedures in developing an easy vibrato, and a lot more. As, I know. There lots of vocal coaches self-proclaimed to be the best in teaching Speech Level Singing Techniques. After going through in-depth research and testing, I personally found that there are only 2 vocal coaches online that really qualified to teach the best in this singing technique, they are Brett Manning from Singing Success and Seth Riggs (the founder and creator of Speech Level Singing). “Singing Success” program focuses on a speech level singing (SLS) technique which was developed by Seth Rigg. The SLS teaches musicians different ways of using low vocal energy when singing. It enables singers to effectively make use of their “head voice” as this reduces the voice from wearing out. Singing Success program can be considered as most detailed speech level singing technique which has proven results provided by several singers from all levels. This is a well known fact and often you will master this advanced singing technique very soon if you are serious about developing your singing abilities or just advancing to the next singing level. A large number of individuals are not contended with several SLS techniques and they say that it has numerous disadvantages and as a result Bret Mannings has made several improvements to the Singing Success’s Speech Level Singing. He has considered all the merits of SLS as well as his personal techniques to create a better SLS. Actually, once you have followed the detailed program version, you will have an additional octave to your voice. It will allow you to sing any type of music you want such as jazz, opera, pop, blues and other genres of music you can think of. The singing success’s speech level singing and studio training DVD includes an interview from the creator himself, Brett Mannings. Brett talks about SLS techniques during the interview and he also gives some excellent examples of several students who have used his program successfully. Some singers on the singing success DVD are likely to embarrass most American or Pop Idol finalists. One thing that is so crucial in the interview with Brett is that he focuses on offering help to individuals who purchase the course with the main aim of attaining full potential within a short time. I know several people who are tired of paying for long singing lessons and yet it seems like the only benefactor is the singing trainer instead of it being you. This is different with singing success because after purchasing the course, you will then be able to coach yourself singing, hence you will not have to make extra payments for other singing lessons. You are definitely guaranteed! Moreover, keep in mind the fact that it will cost you over $300 to have a coaching session of an hour with Brett where he just uses similar techniques which are included in the 12 CDs. In addition, you will be able to get several hours of very detailed instructions for half that price! The singing success’s speech level singing program is the best deal! The singing lessons of Brett Manning are the most popular among the speech level singing techniques online. This reputable singing program provides you with an effective approach that could enhance your ability in speech level singing. If you want to know more details about this revolutionary singing course, you can check it out here. Back to the basic and original. In my opinion, you can go through the video tutorials from Seth Riggs the founder of the Speech Level Singing first before you ever thinking of getting other course by other vocal coach. Hi friends, its wonderful article regarding tutoring and fully explained, keep it up all the time. Speech level singing could be the most straight-forward way to improve your overall singing voice and skills. When you are able to sing in mixed voice which highlighted this exercise, your vocal range will be increased, more flexible, and your singing voice will be totally improved.